Eurostat said consumer prices in the 19 countries sharing the euro rose 1.3 percent year-on-year in June, in line with market expectations, decelerating form 1.4 percent in May and 1.9 percent in April. On a monthly basis, the harmonized index of consumer prices remained flat in June. Speculation has risen since the last meeting that the central bank might be readying markets for tighter policy at its July meeting. Excluding energy, the year-on-year inflation rate rose to 1.2% from 1.1%. The European Central Bank targets inflation 'below, but close to 2%'. 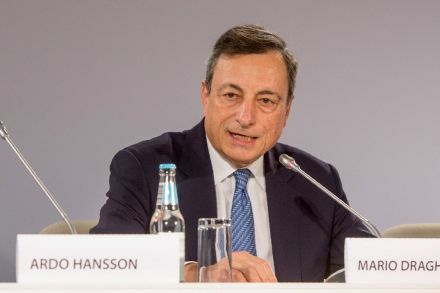 At the beginning of the year Draghi had come under sustained pressure to tighten policy sooner rather than later, given a surge in inflation to the two per cent target in February. Anatoli Annenkov, an economist at Societe Generale, said: "Striking a balance between the weak inflation outlook, above-potential growth and the credibility of instruments remains a major communication challenge for the European Central Bank, with ample room for ambiguity affecting markets".